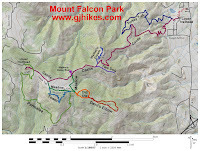 The Turkey Trot trail is located in the Mount Falcon Park near Morrison, Colorado. 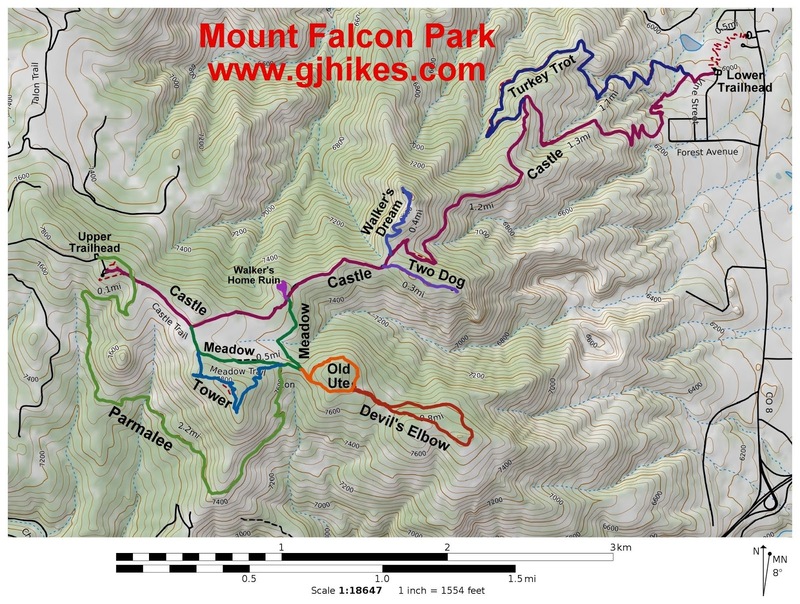 The lower end of the trail begins off of the Castle trail a short distance from the East Mount Falcon trailhead. From there the trail travels northwest toward Red Rocks Park. After some initial climbing the trail begins traversing around the side of the mountain where it enters Bear Creek Canyon. The Turkey Trot trail comes to an end when it rejoins the Castle trail on a ridge. For this post we are beginning at the upper end of the Turkey Trot trail and following it in the downhill direction. As the trail leaves the ridge on the forested Black Creek Canyon side of the mountain there is no place for it to go but down. The trail has a little scree in places but it isn't steep enough for it to be a problem. By the time the trail has traveled about 3/4 of a mile it starts wrapping around the mountain and begins emerging from the mouth of the canyon. As the sun begins setting on Denver the lights start coming on at Red Rocks Park while visitors stream in for an evening concert. On the Morrison side of the mountain the pine trees are replaced by brush and grassy slopes. The last quarter mile of the trail goes through several washes as it cuts back across the base of the foothills. The trail comes to an end as it rejoins the Castle trail a short distance from the trailhead. An afternoon thunderstorm in the area of Mount Evans coupled with a quickly setting sun made for a pleasantly cool hike although snapping low light pictures can be a problem when not using a tripod. For trail runners and hikers that are making a loop out of the Turkey Trot and Castle trails it should come out to just over 3 miles. When we took the photos for this post we hiked all the way to the end of the Castle trail and picked up Turkey Trot on the return trip for a total distance of over 8 miles. The Turkey Trot trail is a good option when you are on foot. If you would like to see it for yourself then all you have to do is 'Take a hike'.